9. We both repeat things ad nauseum just to annoy our kids. 8. We both know that repeating things ad nauseum to kids annoys them now but they’ll thank us for these words of wisdom someday. 7. We are both authors. His is an economics and political book called The Total Power of One in America and mine is a parenting book called The Open-Hearted Way to Open Adoption. 6. We are both obsessive-compulsive about keeping things new. I have been known to keep the protective film over the screen of a new smart phone for weeks after I begin using it, until it falls off by itself. I can’t bring myself to expose my new treasure to all the dirt and grime that’s just waiting to adhere. 5. We both love my mom and are grateful she is such a patient soul. My sisters and I have never let this go. 3. We both hate waste. We’ll get every last drop out of that salad dressing bottle, even if it takes forever and tastes as watered-down as we’ve made it. 2. We are both comfortable speaking to large groups about what we are passionate about. ………………..And the #1 reason I am my father’s daughter…………. 1. [Edited] Did you see our expressions? Image: my family’s archives. Front row: Sheri, Tami, Lori. This is a Generation Fabulous bloghop in honor of Father’s Day. Click for more linkies. You both sound like a lot of fun to be around! Whew! Thank you for reminding me that Father’s Day is only days away! Is it already June?! Lavender Luz, You know I love you and your willingness to share your thoughts. 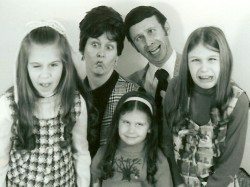 But, I’m going to play devil’s advocate for a moment: if the Number One reason that you are your father’s daughter is that your mom swears it wasn’t the milkman…stop and think–for just a moment–what a comment like that means to an adopted child. I believe that THE person in this life that loved me most was my adad. Throughout my entire life, he is THE person that has come closest to the ideal of unconditional love. And the Number One reason that I am my father’s daughter is that he and I loved each other. No genetics, no similarities, just the need to love and be loved. Point taken…and consider me properly admonished. I love your Number One reasoning about your dad. Now…to change my Number One or not? Love this. 🙂 And … I’m thinking that maybe I’m your father’s daughter, too … except I don’t qualify under #1. 😉 And I’ve never met your mom, though I bet I’d love her, too. Wow, you two are cut out of the same cloth. Great traits such as thriftiness. I love, love, love that family pic! This is so odd — I’m not seeing the photo. Lori, I love this! What a great way to honor your dad. The family photo is priceless. Thank you for sharing. Your family is hysterical! The photo says it all. Yes, you ARE your father’s daughter. And thank goodness you are. Fun post. I love this post 🙂 You always make me laugh when I visit. So witty! This will be my second Father’s Day without my dad. While it’s heartbreaking that he won’t be around, I’m trying to stay positive because this will also be The Hubs’ first Father’s Day. Definitely something to celebrate! That is such a great photo! I too have seen it before, but it explains so much about you and your family! 😉 Also, everything I have heard about your parents and siblings makes me think I would love them too! It sounds like you were raised in a awesome family! I know I tell you this from time to time, but your dad’s advice, about “drawing a wider circle” has always stuck with me ever since I first read about it on your blog a few years ago. Thanks for sharing! What a fun and interesting prompt in honor of Father’s Day! Love the photo…so many amazing ways in which you and your father are alike including being authors. Why do I relate to so many of these reasons? Hmmm…possibly because I am my father’s daughter? Happy Father’s Day, Dad! I did a complex analysis of the Laffer curve, including a wide confidence level to go with a standard deviation. The resulting histogram concluded that only those who met the threshold of the covalent would make the list. Looking back at my previous comment, it all still applies. I still love this list!